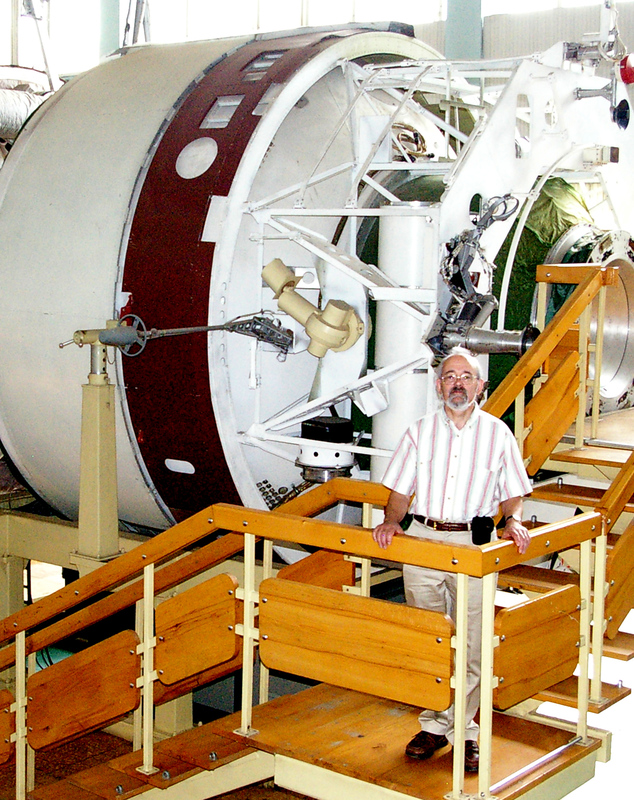 Andy Thomas G0SFJ took of this picture of John Heath G7HIA at the Cosmonauts’ steps leading to the Mir training module in Star City near Moscow. Over the years, many Cosmonauts have been photographed on these steps before their journeys into the Cosmos. 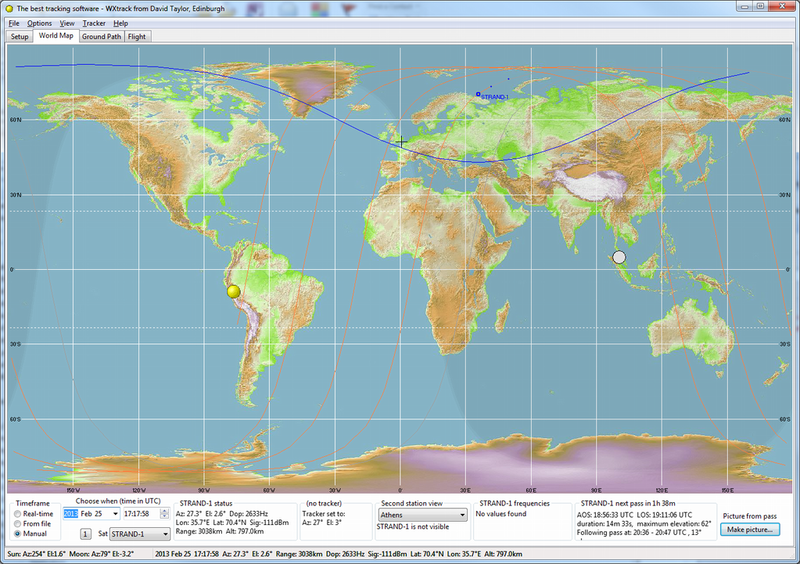 AMSAT-UK is very saddened by the passing of John Heath, G7HIA. He was a long standing member of AMSAT-UK, and contributed to the amateur space programme in many ways during his lifetime. John was a regular attendee at the annual AMSAT-UK Colloquia for many years and he enjoyed meeting up with his friends who shared his passion for satellites. Sadly his ill heath in recent years prevented his attendance. 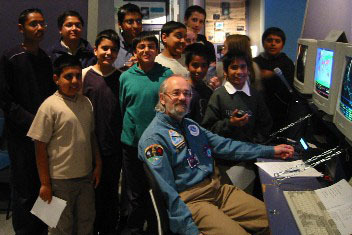 In the days before his passing, John was in contact with AMSAT-UK; and made a significant financial contribution to the FUNcube project. He chose to do this by making the donation via the Radio Communication Foundation, which, as a registered charity will be able to claim any income tax paid by John as Gift Aid. The size of his donation is very considerable, and will be used at the discretion of the AMSAT-UK committee. Such is the extent of his generosity, that it may be feasible to consider the construction of a further complete CubeSat. AMSAT-UK is very grateful for this donation. John will be sadly missed by all members of AMSAT-UK who knew him during his life, and we send our condolences to his family. I was very saddened to learn of John’s passing. We had exchanged many e-mails during the last few years. I didn’t know John very well, although we had met at the ASAT-UK Colloquium on several occasions. Topics we discussed by e-mail included processing Delphi 3C telemetry, OSCAR-11 spin rate, automatic Doppler tracking and ARISSat-1 decay. John was very active in using our satellites and promoting their use to others. For several years he was net controller of the Midlands two metre AMSAT net. He also wrote the Space column for RSGB’s RadCom magazine for a number of years. He contributed many articles to OSCAR News, recently in the September 2012 issue about ARISSat-1 orbital decay. His last contribution to OSCAR News was a short item in the December issue, congratulating AMSAT-UK on their 200th issue of the magazine. He included a photograph of himself, Astronaut Ron Parise WA4SIR and Geoff Perry, founder of the Kettering Group of satellite observers. It was taken at the 1998 Colloquium. During the course of our discussions John mentioned that he was having some unpleasant hospital treatment. He also told me about his working career, which I thought may be of interest. As a teenager he was interested in organic chemistry and went to work in industry, eventually in the R&D department at Bakelite in Tyseley, Birmingham. In the 1960’s/70’s he worked on the phenolic resins used to make copper clad PCB material, and did the first industrial synthesis on nonyl phenol by ion exchange. There were massive world stocks of Nonene at knock down prices so they were looking for a way to use it to make phenol/formaldehyde resins used in PCB manufacture. His YL Pam at that time worked in a small hairdressing supplies business and he sometimes worked with her when they needed extra staff to cover late night opening. After his marriage to Pam, her firm decided to open a branch in Leicester and they were offered the opportunity to re-locate and run the new operation. Together they built up the business, diversifying into related activities with a skin care manufacturing company (where his science background was invaluable), a beauty products wholesale business and a mail order operation. The business expanded from 6 people to a staff of nearly 200 on four sites. John said that Amateur radio helped to keep him sane by giving him a totally different set of things to think about and emptied his head of business concerns for a few hours each week! A few years ago Pam was diagnosed with a serious illness and confined to a wheel chair. This caused them to bring forward their retirement plans and they moved to Devon. My condolences to Pam, family & friends. RIP John, we will miss you. Jim Heck G3WGM, Honorary Secretary of AMSAT-UK and project lead on the FUNcube amateur radio satellite project, will be giving a presentation on FUNcube-1 to the UKSEDS National Student Space Conference (NSSC) that takes place in Bristol on February 23-24. The NSSC is an annual event that brings together students, academics, and professionals from across the country to share knowledge of space, discuss the challenges facing the sector, and to create new links between groups. It features talks by leading space science and industry figures, and opportunities to take part in discussions and networking events. This year’s NSSC is hosted by Bristol SEDS, part of the Bristol CHAOS Physics society, at the University of Bristol School of Physics. The impressive line up of speakers includes Alan Bond of Reaction Engines Ltd on the SKYLON Development Programme and John Thatcher of Astrium Satellites Ltd who’ll be talking about MIRI & the James Webb Space Telescope. In this video Surrey Space Centre’s Dr. Peter Shaw talks us through the anatomy of the highly advanced UK CubeSat STRaND-1. 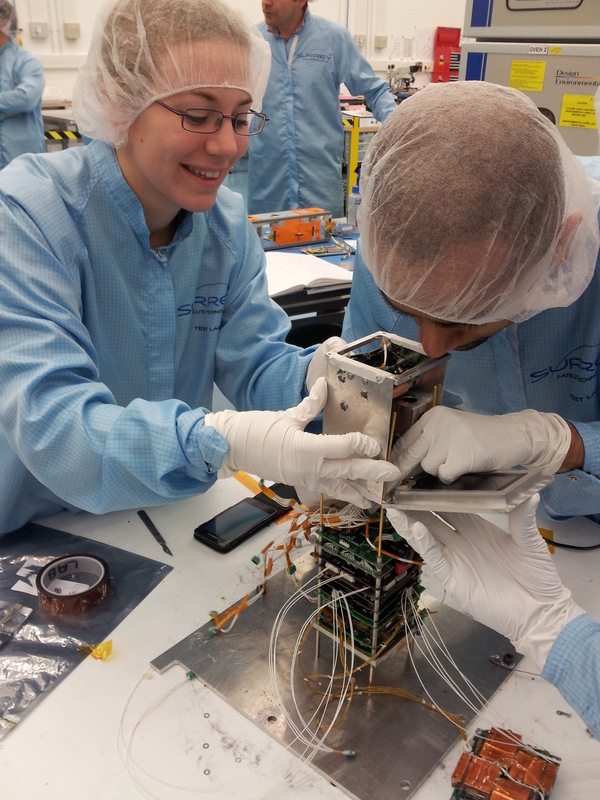 The innovative amateur radio STRaND-1 CubeSat aims to carry a NEXUS Android Smartphone into space to demonstrate the feasibility of using cheap Smartphone electronics to control a spacecraft. A software-based speech synthesiser will be included to pay homage to the UOSAT family of satellites (OSCAR-9 and OSCAR-11) that were launched in the 1980′s. STRaND-1 will carry an amateur radio payload with an AX.25 packet radio downlink on 437 MHz using data rates of 9k6 or 19k2 bps. The January issue of the free publication SatMagazine features an article on the UK Space Agency’s first satellite UKube-1. It will carry an amateur radio subsystem and a launch on a Soyuz rocket is planned for the 3rd quarter of 2013. The article on page 6 includes a picture of Steve Greenland of Clyde Space taking delivery of a set of AMSAT-UK FUNcube boards which will provide a 435/145 MHz linear transponder and a 145.915 MHz BPSK telemetry beacon for educational outreach. Starting on page 24 is an article ‘Truly Educational Experiences… With Nanosats’ covering the University Nanosat program.